You may remember quinoa (pronounce “keen-wah”) from my adventures with Gluten-Free Quinoa Veggie Burgers, or my (top post on the blog!) Thai Red Curry Quinoa. If you haven’t been officially introduced yet, let me do the honours: quinoa is a high-protein ancient grain from the Andes mountains in South America. It comes in “regular” (white/ivory), red, and black. 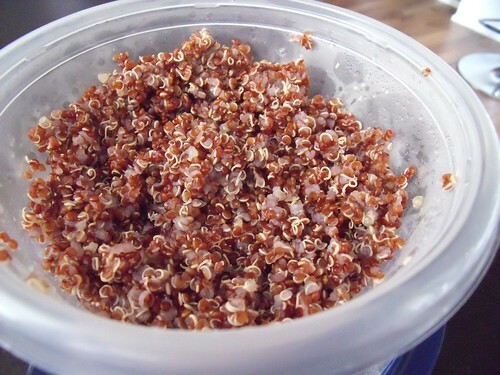 I often mix red and white quinoa because it looks so pretty! The quinoa I currently have on hand is red; I can’t tell the difference in colour by taste, so it comes down to an aesthetic preference here. Because quinoa is high in protein, it comes out healthfully low on the glycemic index (unusual for a grain! ), and doesn’t spike your blood sugars. Rinse quinoa in a fine-mesh sieve to remove the bitter outer coating (saponin) that may be coating the grains. Place quinoa and stock (or water) in a pot, and bring to a boil. Give it a fluff with a fork, and voila — you have quinoa ready to go! Turn it into a quinoa salad (pssst… check out tomorrow’s post for a quinoa salad recipe). Eat it as a side dish, as you would any other grain (like a substitute for brown rice). Have it as the base under a curry — it would be great with Kale and Lentil Dal or Red Kidney Bean Curry (Rajma). Make an awesome tabouleh using quinoa instead of bulghur (mix with tomatoes, parsley, and lemon!). When I put a call out on twitter asking what people did with their cooked quinoa, the folks at Frida Restaurant here in Toronto (@FridaRestaurant) mentioned they “like it as a tabouleh type salad with tons of fresh veggies and a lemony tahini dressing.” Yum. Must try that out! Add some milk & heat through for a quinoa porridge, great with cinnamon and fruit — or you could use it in place of barley for a Coconut Chai Porridge. Use it instead of couscous or other grains in your favourite recipes. I LOVE quinoa! One of the ways that I really enjoy it is to make a marinara sauce and put it over the quinoa in place of spaghetti. It is really delicious! Ohhhh, that sounds gorgeous!!! I haven’t tried it that way yet, and seeing as I love anything with tomato sauce, this is a great plan!